The word on boise is almost—but not entirely—out. After all, the culture here embraces floating the Payette River on a Wednesday, lunchtime rides on the 190 miles of singletrack that start right on the edge of town and a vibrant downtown with bars, cafes and eateries serving everything from coconut lattes to double IPAs. You simply can’t avoid menus with potatoes on them in Boise—not that it’s a problem. One restaurant that embraces the Idaho spud is Boise Fry Company (boisefrycompany.com). Choose your fry from a rotating menu consisting of over half a dozen different types of potatoes, a handful of different fry cuts, and several different housemade dipping sauces that make ketchup look like mud. The Basque Market (thebasquemarket.com) on Grove Street, right downtown, is just one of the Iberian eating establishments on Basque Block, Boise’s nod to one of the largest Pyrenees expat groups in the United States. The Market offers delicious traditional dishes such as paella and pintxos (Basque tapas) as well as classes and tastings. Stay downtown-close at the Grove Hotel (grovehotelboise.com). Bonus: It’s linked with the home arena of the Idaho Steelheads ECHL minor league hockey team (hotel guests even have their own entrance to the ice). The contemporary and elegant hotel has 250 rooms in six different styles and an extensive spa and fitness facility on the fifth floor with lots of windows and expansive views (you’ll find plenty of locals coming here to work out, too). The kids will love the Hampton Inn & Suites Boise-Downtown (hamptoninn3.hilton.com), with its fun wading pool and joined suites that make putting kids to bed easy when their parents still want to party. If you simply want to wheel around town, rent cruisers from any Boise Green Bike (boise.greenbike.com) location and hit the greenbelt, which weaves along the Boise River and through a number of city parks (and right by the Zoo). Boise is one of the best mountain biking cities in the U.S., and the local Boise-Eagle trails won a gold-level Ride Center recognition from IMBA thanks to a well maintained network that has something for everyone. Hit Hulls Gulch for a variety of rides right off the pavement or test your skills at the Eagle Bike Park. 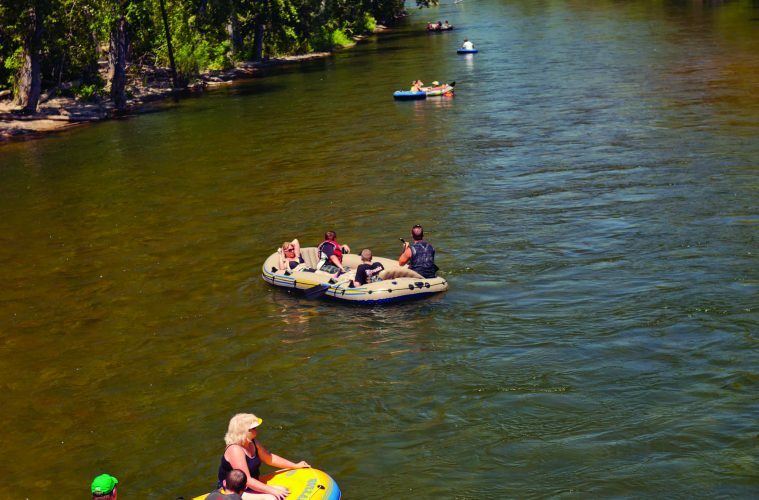 Boise blazes come summer; beat the heat with tube float down the chilly Payette. Come evening, wind down with a show at the Egyptian Theater (egyptiantheatre.net).